When it comes to downloading images, video and music from the Internet, we have the risk of finding that the problem that each of the files that we download is in a different format, size or different quality, so it's advisable to have an application like MediaInfo, thanks to which it's possible to quickly view all the technical data of any multimedia file. 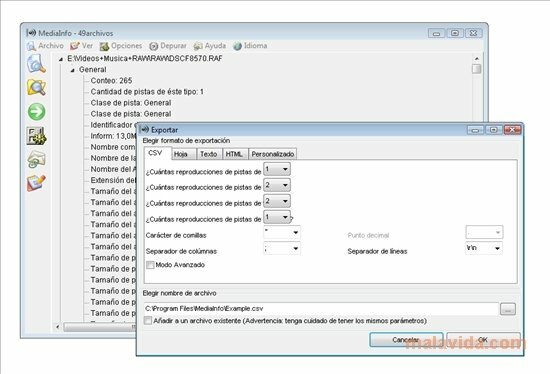 It's only necessary to open any file from a program and, in a matter of minutes, we can view all the data related to it as can be for example bit depth, the number of audio channels or the coding system, as well as the artistic data (artist, name of the track, album of the title, publication data,...). Very useful for whoever works with multimedia files. Once we've analyzed any file, the program has a function with which we can export all the data in several formats like CSV, HTML or TXT. 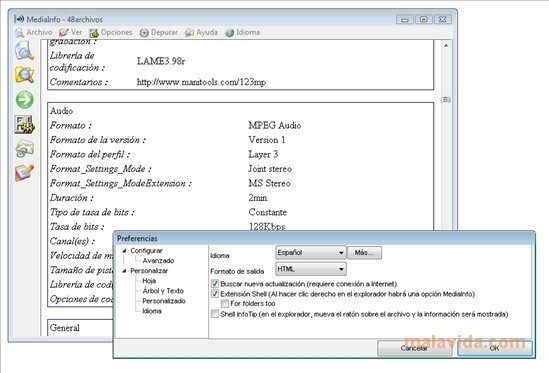 If you're looking for a tool with which to know any detail of your multimedia file collection, download and install MediaInfo.